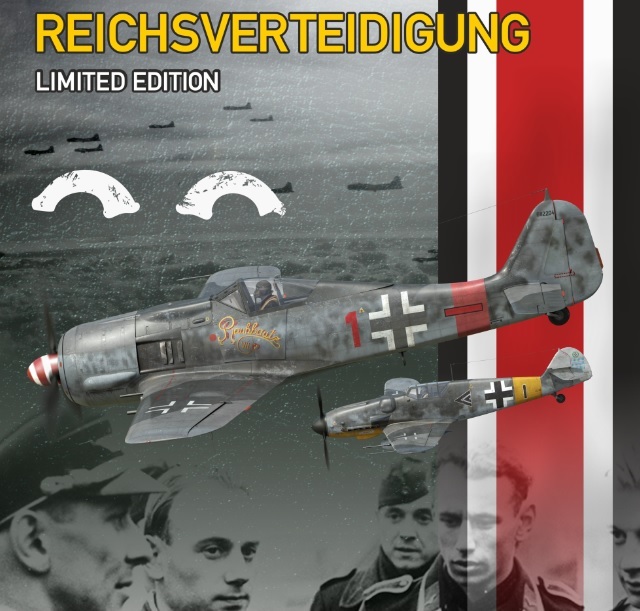 FalkeEins - the Luftwaffe blog: Fw 190 A-8 W.Nr 682204 (red 1) of Lt Bretschneider of 5./JG 300 - Reichsverteidigung Limited Edition Eduard 48th scale. Fw 190 A-8 W.Nr 682204 (red 1) of Lt Bretschneider of 5./JG 300 - Reichsverteidigung Limited Edition Eduard 48th scale. 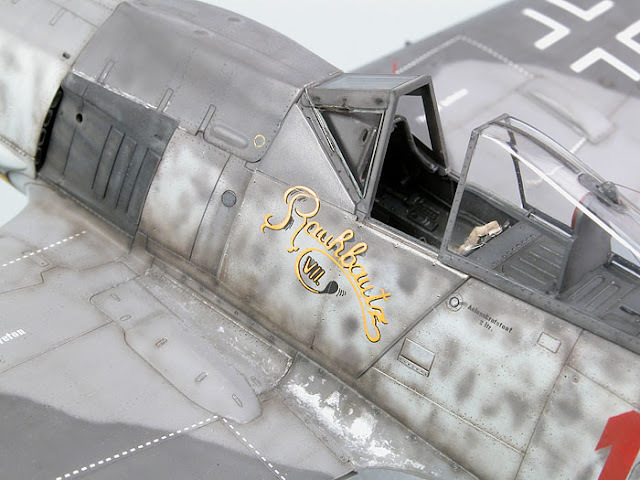 "...I have recently purchased the new Eduard model of the "Sturmbock". One of the seven options on the decal sheet is for the Fw 190 A-8 W.Nr 682204 (red 1) of Lt Bretschneider of 5./JG 300 in late 1944. 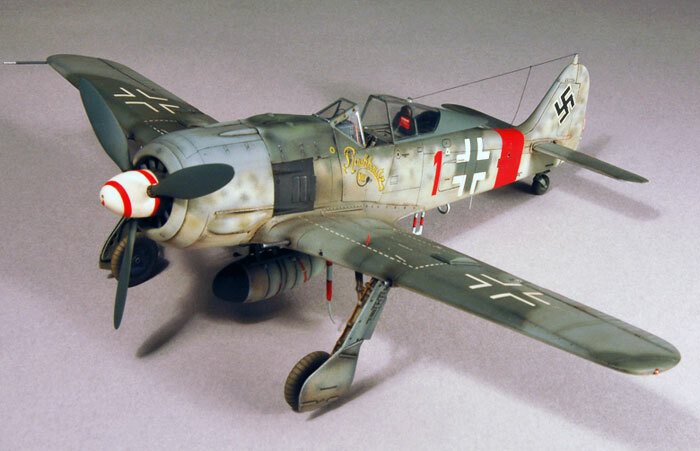 Pictures of this machine can be found in most references covering the history of JG 300 especially page 70/71 of volume 2 of the history of this unit written and compiled by Jean-Yves Lorant and entitled "Bataille dans le ciel d'Allemagne" Alternatively see page 363 of "Focke Wulf Jagdflugzeug..." by Peter Rodeike. 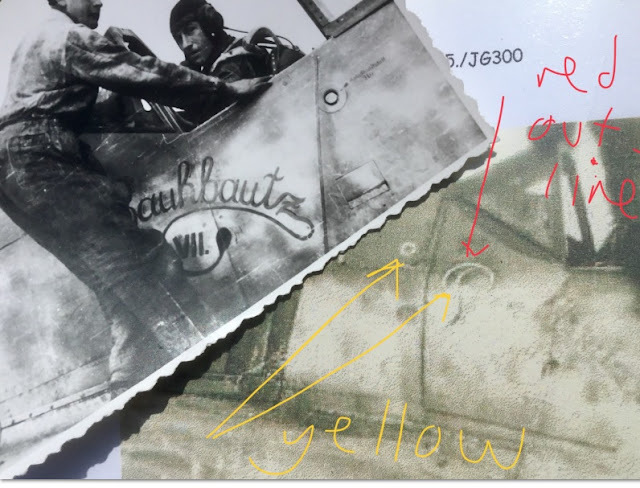 The instructions in the Eduard kit state that "according to new sources, the inscription below the cockpit (Rauhbautz VII) was yellow with red shadowing... and the spinner carries a white spiral on a red background...". As far as I know there are no new sources as such - but modellers have been finishing kits of Bretschneider's machine in this fashion for many years. That said the Rauhbautz VII inscription on the Sturmbock of Lt Klaus Bretschneider is usually depicted as being red, according to one expert " a lighter red than the RV-band (which was wine red) with dark shadows ". At least this is the colour that the veterans recall. However some modellers have preferred to depict the inscription in yellow with a dark outline. Two examples from Chris Wauchop and Floyd Werner to name just two.. So while I tend to doubt there are any new sources as such which could confirm the colours either way Eduard have wisely chosen to provide the modeller with both options in their kit. However take a look at the three images below which are well known. Note the yellow ring on the rear cowl edge signifying the Notleistung emergency power boost. Note how it corresponds more or less to the inscription - which is outlined in a darker colour. And of course on some types of film yellow is one of those colours that does look a little dark as the experts are always telling us. Equally panchromatic film can turn red a much paler shade - virtually white - in certain lighting conditions - the images of oxen pulling machines of III./JG 300 with 'white' fuselage bands and gear legs comes to mind here. Here are three images where the 'Rauhbautz' inscription appears to be quite 'light' in shade..
On 24 December 1944 the acting Kommandeur of II. (Sturm)/JG 300, Klaus Bretschneider was shot down and killed by Mustangs. Call sign Specht Anton - Bretschneider- scrambled at the head of JG 300 against an 8th AF raid - was easy prey for the aces of the 357th FG. His Schwarm had been directed right into the path of the aggressively flown P-51 Mustangs. 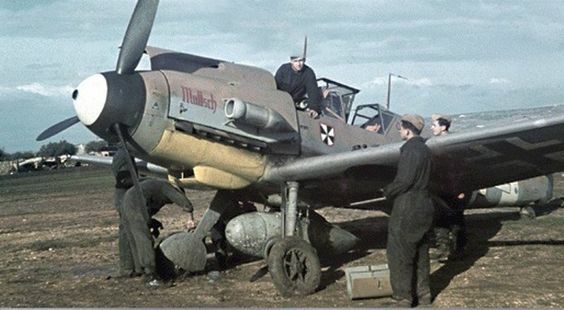 His Sturmbock Fw 190 A-8 (W.Nr. 682204) was a specialist bomber destroyer variant fitted with cockpit armour and 30mm cannon and entirely unsuited to dogfighting. The hapless German pilot plummeted to earth near Kassel, almost certainly dead at the controls. His loss was a hard blow for his pilots. 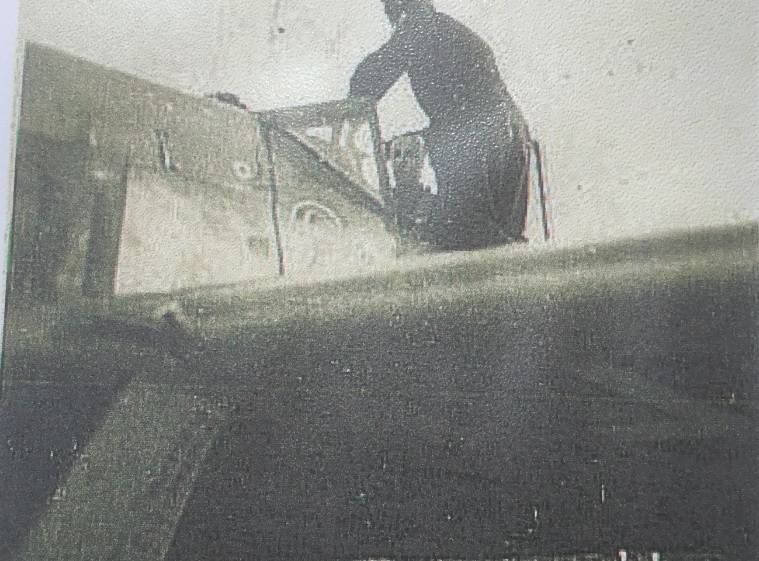 Klaus Bretschneider flew Wilde Sau sorties with JG 300 in July 1943 with 6. Staffel then 5. Staffel, claiming 14 victories by night. Before being appointed Kapitän of 5. 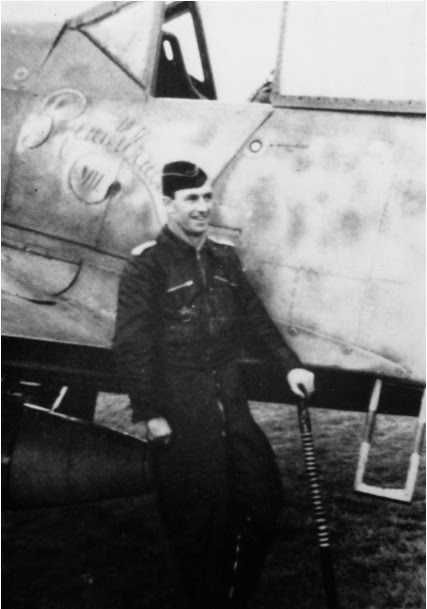 Staffel and serving as acting Kommandeur, Klaus Bretschneider served also in the Stab II./JG 300 and Stab/JG 300 and by the time of his death he had claimed 20 additional victories against US aircraft by day. The 'eternal Leutnant' had been promoted to the rank of Oberleutnant and, by late 1944, was a rare Defence of the Reich fighter leader to wear the Knights Cross. Both Chris and Floyd's superlative model builds can be seen on hyperscale.